Crock-Pot, online at Crock-Pot.com, is your destination for "the original slow cooker." At Crock-Pot, you can find a variety of slow cookers including: manual, programmable, and cook and carry cookers. You can also buy entertaining slow cookers including a trio cook and serve. There are even Crock-Pot Double Dippers online at Crock-Pot. In addition, you can find recipes, cookbooks, crock ladles, slotted turners, and tongs on sale at Crock-Pot. RetailSteal.com has the best Crock-Pot coupon codes, Crock-Pot discounts, and Crock-Pot promo codes. Shipping and handling rates at Crock-Pot depend on the price of your purchase and your shipping destination. See website for full details. Exclusions may apply. Act now and enjoy a 20% discount on select slow cookers from Crock-Pot.com Click link to shop. At Crock-Pot, get free shipping on all orders over $100. Click link to shop online. At Crock-Pot, purchase a Crock-Pot Crock Ladle and pay only $4.99. Click link for savings. Get free slow cooker recipes at Crock-Pot. Click link for recipes. Get the Double Dipper at Crock-Pot.com for only $24.99. Click here to get started. 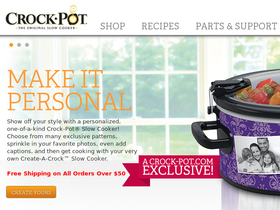 Shop on Crock-Pot and customize your very own crock-pot. Purchase a Crock-Pot Trio Cook & Serve and pay only $99.99. Click link to shop online. Enjoy $40 off when you shop at Crock-Pot and purchase The FOODSAVER® Center Kit. For a limited time pay only $9.99! Click on this promo link to save $40 on this select slow cooker from Crock-Pot. Click to save.